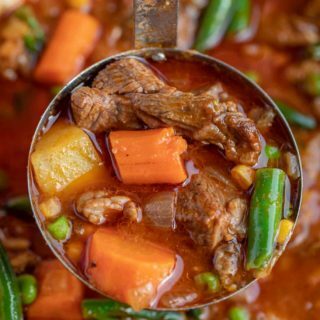 Vegetable Beef Stew is the PERFECT combo of tender beef and fresh veggies in a savory beefy tomato base, that's full of vegetables, rich flavors, easy to make and in just one pot! Preheat the oven to 325 degrees and season the beef chunks with salt and pepper before dredging in flour. Put the butter and canola oil in a large dutch oven on medium heat and brown the beef on all sides in batches (3-4 minutes per batch) until it is browned very well. Remove the last batch of the beef and add in the onions, garlic and carrots and cook for 2-3 minutes until slightly caramelized before adding the potatoes in along with the broth, tomato paste, bay leaf, thyme and Worcestershire sauce and stirring to combine. Add the beef back into the pot, cover and cook in the oven for 2:30 hours, then add in the green beans and peas for the last 30 minutes before removing the the oven.